Welcome to Bond Girl Hair. Thanks for stopping by! But first, a bit about us. We’ve been obsessed with extensions for a loooooooooong time (yes, pun intended). Our goal is to make your hair dreams come true. So whether you’re looking to add a bit of length, a lot of volume, or you’ve been waiting your whole life to say “Long hair, don’t care.” and actually mean it, then you’ve come to the right place. We believe that extensions should be an extension of you. 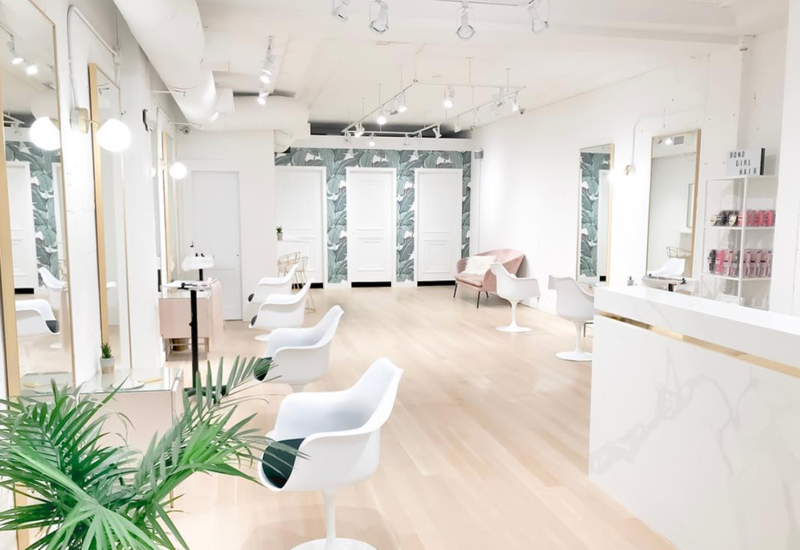 So everything we do, from custom ordering your hair, to selecting your ideal method of extensions, is all about matching your personal style, look, and hair goals. This is how we ensure seamless & natural looking extensions for every single one of our clients. Yes, even you! You don’t need to get bonds to get that Bond Girl Hair! Lightweight, comfortable and re-usable, tape extensions are one of our most popular methods. They’re attached by fusing your hair between two tape panels. They require maintenance/a lift every 6-8 weeks and the hair is reusable up to 8 months to a year when properly cared for. Also known as fusions, hot fusions, or keratin tips, this method is tried, tested, and true. When installed correctly, bonds are lightweight, discreet, flexible, and durable. They’re attached by molding a keratin tip containing an individual bundle of hair around an equal amount of your hair. They can be worn for 3-4 months straight with no maintenance (hell yeah!) and can be re-used by re-tipping the bonds. This method is all the rage! Why are they so loved? Let us count the ways. No heat or glue is required to attached these bad boys. Maintenance and lifts are quick and easy. No residue! They require a lift every 6-8 weeks and the hair can be reused up to 8 months to a year if properly cared for. They are comfortable, lay flat to the head, are discreet, and provide MEGA volume. These are best suited for thicker, course hair. Want the signature bond girl waves on the daily? No problem! Got any questions we didn’t answer? (The FAQs are just below, btw). Send us a message! And don’t forget to follow us on social. You can send us an email (bondgirl.hair@gmail.com) to set up your consultation. Because of the custom work that we do, a consultation is required before an install appointment. A non-refundable $50 deposit is required in order to book a consultation. The deposit will then go towards any future services that are booked with Bond Girl Hair. DO HAIR EXTENSIONS DAMAGE MY OWN HAIR? With proper care and maintenance, our extensions will not damage your hair. In fact, many of our clients find that their own hair is longer and healthier after their extensions are removed. Proper maintenance is extremely important, so we will go through all the steps in detail during your consultation. It is also extremely important that when the extensions are removed, they are removed by a trained professional, as removing them improperly can be damaging. WHAT KIND OF HAIR DOES BOND GIRL USE? We only work with the best premium hair. We have several different suppliers that we use depending on which is best for your hair type. All of our hair is 100% Premium Remy human hair. We accept cash, credit, and donuts (just kidding).